THE PATH OF PROMISE. Episode 4. #Series Stories By J. Praise. 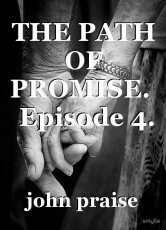 TITLE: The Path Of Promise. As Winifred looked into the mirror, all she could see is a bride dressed in white wedding gown with a broken heart. She had a smile on her face but her soul was screaming. She felt like quitting the whole wedding and running away. She needed time to clear the soar in her head. She wanted to stay away from John for a while. She needed to be sure of her judgements and to make out her feelings properly. But, she's stuck with the wedding now. She took in a deep breath as she proceeded to join Daniel in the big church room. As she walked in the aisle, she felt angelic and trilled. But the cold in her soul was inept. She was not sure of her steps, not because she was shy, but because her feelings was giving her away. Her legs dragged her forward, but her heart pulled her backwards. She needed all her strength to fight the pressure of Want and modesty. As she walked, she held her head up high,but her eyes searched for John. She wondered how or what he would be feeling right now watching her walk to stand beside Daniel at the altar. She couldn't help feel pity for John, but that part of her was dead to her. At least that was what she thought. She needed to move on with Daniel. She needed to have her life completely together around Daniel. No doubt she still feels strongly attached to John, but sometimes we make sacrifices to stand a chance to be happier. (John taught her that in high school). So, cutting every attachment with John, and getting married to Daniel is the sacrifice she was willing to make. At least for the thought of it, she felt she could do it. Her eyes came in contact with John as she finally stood in front of the congregation. He looked blown out, and his eyes were pleading. It was like seeing her and Daniel about taking the vows, cut his auricles and let the blood gush from his hurting heart. John looked pitiful! Winifred's heart beat ran like a rocket set for space. She could hear it beat so fast. She tried as much as possible to look away from him, but no matter how hard she tried, she felt impulsive to him. As Daniel took her hand, she nearly slipped her hand from his. She could no longer stand it, seeing John had blown all her covers away. Here she stood vulnerable to his presence. "Are you alright honey?" Daniel asked. He could have noticed the chill in her look. Her reactions could be mistaken for being nervous. But she was not only nervous, she was scared too. She was scared she wouldn't be able to say the "I do". She was scared because she couldn't stop herself from thinking, thinking she could just scurry to where John was sitting and plant a kiss on his lips, take his hand and dash out of the church together. She needs to make this sacrifice. The congregation was quiet as a cemetery as the preacher announced it was time for the 'wedding vows'. Daniel smiled at her as he took the manuscript for the vows. Something in his smiles could tell how eagerly and happily he waited for this moment. He looked like a child. And that made Winifred smile too. "Do you take Winifred Jackson, as your lawful wedded wife, to love and to respect till death do you part?" The preacher asked in a thunderous voice. "Yes I do!" Daniel answered happily. This time John was up and in front of them taking pictures. His presence caused a lot of unease to Winifred. From time-to-time she took a peak at him. Their eyes met a few times too. Then it was her turn to take the vows. "Do you take DANIEL CHRISTOPHER, as your lawful wedded husband, to love and to respect till death do you part?" The preacher asked. Daniel's eyes grew questioning as Winifred stood without an answer. The congregation was in awe now. What could she be thinking about? What is happening? Those were the questions being heard from the congregation. After a long pause she answered. "I do" She said coldly. A sign of relief fell deep on the face of Daniel and the congregation. Winifred has crossed the big line. She has finally accepted to be with Daniel no matter what. For the few minutes she couldn't reply, her mind had played her to refuse the vow. Her feelings begged her to follow the path of the past. But she needed to be sane. She made her own decision, neglecting whatever she feels. She decided to accept the moment. She made the sacrifice and shut John out. The whole rites was done and it due for proclamation and blessings. The preacher looked to the congregation. "Before I gave my blessings, is there anybody here who wants to say anything contrary?" He asked. The congratulation was quiet and no sign of an opposition was shown. "Speak now of forever hold your peace" The preacher said again. The congregation was quiet again. "I guess in absence of that, I will proceed with the...." He was cut short as he saw a hand raise in the congregation. Everyone strained their attention towards the opposition. It was John! Winifred's heart was pounding now. She didn't expect John would oppose. At least for his ego, but he did! After some seconds of just staring, he finally spoke. "I know it is crazy, but I love Winifred" he said as he paused for a while. The congregation was murmuring now. "I cannot walk out feeling like I've attend a happy wedding. When my friend had just gotten married to the love of my life" He said. He turned and began to walk towards Winifred now. "Winifred, I never left you. I have died a thousand times waiting to be one with you again" he paused. "And this is how I watch you slip away?" He continued as tears rolled down his face. "Remember the promise I made to you the night before you travelled right?" "I've followed that path and kept it all my life. I've traveled because I wanted to look for you, I wanted to be with you again"
"I'm not married because there's a path I took, 'the path of promise', to always be here waiting for you. Because I love you"
His eyes were flooded now. He could barely see with the tears running uncontrollably. "Winifred, do you still love me?" He asked with so much enthusiasm. Like his life depended on it. Winifred looked lost and transfixed to the madness that was playing before her eyes. It intrigued her and annoyed her at the same time. She walked towards him with tears building up a wall in her eyes. She couldn't let it show. "This is madness John..." She said. "And you get me even crazy with it"
she said as she held him close to herself in a tight hug. The congregation was almost screaming now. Daniel looked like a ghost sent to hell. But Winifred couldn't care least. She had built walls and shut John out just few moments ago. But when he dared to speak up, he tumbled down the wall she had built. Immediately he asked her if she loves him, she realised she would forever be unhappy without John. "I love you soo much, John Praise"
And with a kiss they sealed their fate. Inspired by true people, but partly fictional events.